So you’ve found and purchased your dream kitchen and you want to ensure the quality of installation is of a standard that you would expect from a skilled craftsman. Then our fitted only service may be what you were looking for and may result in quite a substantial saving. Our install only service gives you the flexibility to purchase any kitchen then have it fitted by our highly experienced and skilled carpenter ensuring exceptional attention to detail . We offer a complete start to finish service from planning to completion, undertaking all surrounding building works necessary to achieve your dream kitchen. Whilst some disruption is unavoidable when having a new kitchen, we pride ourselves on a stress free installation from start to finish. We can supply a wide range of high spec kitchens to suit your taste and requirements at prices that are only available to us. We understand that budget is the key to any project and we have built a reputation for completing projects on time and within budget. All of our work is undertaken with great care and respect for your property with as minimal disruption as possible. 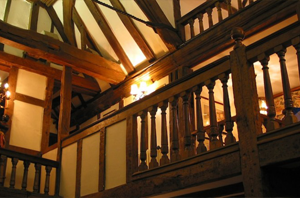 Sterling joinery are specialists in the sympathetic restoration, conversion and extension of period properties and listed buildings. We pride ourselves on the relationships we have built up over the years with our clients and have an excellent reputation for quality and attention to detail. JON CRESSWELL is a skilled craftsman who is vastly experienced in using traditional building methods and materials and specialises in all aspects of period building restoration. He takes great pride in the excellence of his workmanship and offers a comprehensive service from concept to completion to ensure your total peace of mind. We believe passionately in protecting and maintaining our environment for present and future generations to enjoy and this commitment is reflected in the quality of our craftsmanship from stonemasonry to carpentry, joinery to plastering. You can be assured of a service that is of the highest standard, tailored to your specific requirements, competitively priced and undertaken with a minimum of fuss. As a part of its long term commitment to restoring and maintaining period buildings, Sterling Carpentry is always pleased to offer advice and quote for all your period building requirements. With low overheads and quality trade suppliers, we can guarantee to supply and fit your new kitchen or bedroom for a far lower price than many high street stores, you could make a substantial saving!